Rapid growth and global expansion created a need for Coinbase to provide an automated digital process to complete ID verifications and comply with regulatory requirements throughout the company's global business model. 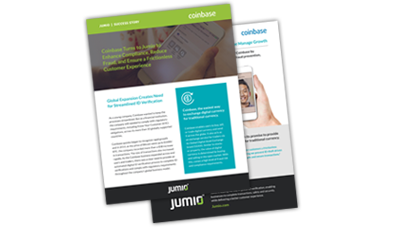 Jumio was selected to help manage the expansive growth of Coinbase by providing a digital ID verification solution that would aid in fraud prevention, while ensuring a quick and easy experience for users. Complete the form on this page to view the complete success story.